You may be looking for Rico Garlik, a multiplayer character in Grand Theft Auto: Liberty City Stories. Rico is a member of the Cuban gang in Grand Theft Auto: Vice City. Tommy Vercetti, looking to prove himself to Umberto Robina, has to participate in a boat challenge with Rico looking over him. 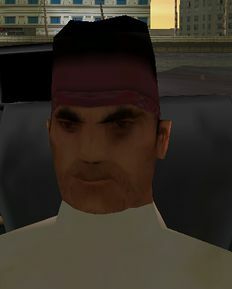 Later, Rico continues to help Vercetti and steals some of the Haitians cocaine and to ambush the Haitians, but is seemingly killed when the Haitians blow up his boat. However, Rico is seen with the Cuban motorcade that invades the Haitian compound to destroy the Haitian Drug Factory. Rico may have survived the explosion, he may be another character with the same name, or this may be an oversight by Rockstar. Rico was voiced by Hunter Platin. Rico shares the same character model as the Cuban gang members. Rico: "Hey, I'm Rico. You the man with the big cojones?" Mission prompt: "Go meet Rico. He'll drive you to the meet location." Mission prompt: "Go and meet up with Rico and the other Cubans." This page was last modified on 2 July 2012, at 18:02.